The defending champion Golden State Warriors will host the Detroit Pistons in a battle of two playoff teams on Sunday night. 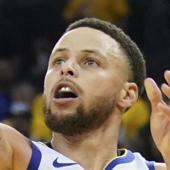 The match-up between the two teams is the second - and final - of the 2018-19 season, as the Pistons walked away with a 111-102 victory over the Warriors in Detroit back in December. After suffering their worst home loss in over a decade at the hands of the Dallas Mavericks on Saturday night, it's safe to say that the Warriors will be looking for a bounce back win. Pistons: The Pistons enter the evening sitting at sixth in the East, but they have to continue to win if they want to secure a spot in the postseason, as there are several teams in the hunt directly behind them. As it stands currently, they would face the Philadelphia 76ers in the first round. Warriors: The only question remaining for the Warriors for the rest of the regular season is if they will end up in the first or second seed in the West. Either way, they will be the prohibitive favorite to win the title, again. The Warriors are the right pick in this one for a couple of reasons. First, the Warriors will be looking to avenge their loss to the Pistons earlier in the season, as well as their blowout loss to the Mavericks on Saturday night. Plus, the Warriors are one of the league's best teams at home (25-11), while the Pistons are below .500 (14-22) on the road.